Cablematic cable tools are wire and cable preparation tools for CATV and telecommunications – Cablematic is a brand of Ripley including coring and strippers, cable cutters, drop cable trimmers, compression and crimp tools. Cablematic tools enable stripping and preparation of coaxial and fiber optic cables including trunk, distribution cables in addition to drop and messengered cables. Coxial and fiber optic cable tools include: Coring, Stripping (Mid & End Span), Sheath/Jacket Stripping, Cable Cutters/Strippers and Conductor Cleaners/Scrapers. 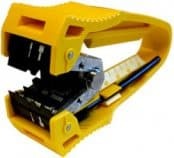 Cable cutters are designed to strip and cut copper and aluminium conductors, solid and stranded. Tools are available to remove the outer sheath or jacket and armour from CommScope P3 JACASS and QR JACASS underground construction trunk and distribution cables. Complete range of HV Cable Tools available for medium/high voltage power, transmission and distribution cables. Thorne & Derrick provide competitive prices and fast delivery from stock for the complete range of Cablematic cable tools.